All proceeds from the sales of the myNestEgg and collegeFund (CF is free this week) apps between March 13th and March 27th will be donated to the Saving the Children for the disaster relief efforts in Japan. If you prefer to make a direct donation to the relief efforts (you can probably get more bang from your bucks that way), Apple has set up a way for you to do it via iTunes here. It’s that time of the year again, the time for new year’s resolution and planning. The past year has brought interesting addition to our family: our baby girl “Youyou”. On business (or iOS app) side, I joined the iPhone (iOS) developer program in July (paid the $99 annual fee), and released the first app myNestEgg ~ the retirement calculator in middle Sept. 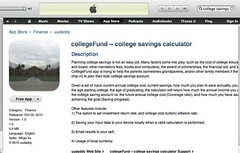 The second app collegeFund ~ college savings calculator shortly followed. The results exceeded my expectation, as I released a few updates to fix the problems/add features. Meanwhile, I went to the Voice That Matters – iPhone developer conference (Philadelphia) in Mid Oct. Meeting iPhone developers and learning new things are the main take aways there. For the new year, I am thinking of two things: 1) Continue to improve the existing apps; 2) Work on an iPad version of retirement savings planner. I don’t have a definite timeline yet, as I still have a day job, but I hope to release the iPad app before the iPad 2 arrives. (11-21-2010) I received a user bug report this morning: the calculation results is not right due to the extra comma separator in “beginning savings” and “salary”. I fixed the problem this afternoon and submitted the binary (version 1.3) to App store. Stay tuned. 2) Add “shake” function to “Settings” tab bar. When at “Settings” tab, if the user shakes the phone gently, the rates will reset to default values: 7% annual investment return, 2% annual inflation. Note the user still needs to tap “Set Rates” button to make the rates take effect. 3) Fix the minor problem where the inflation rate picker moves when the user switches to the “settings tab”. Note this behavior has not affected calculation results. I just found a bug shortly after the release. If someone reports the problem to me, he/she will have the opportunity to win the $25 Amazon gift card. (Update Dec 16, 2010) Free again for limited time (until Dec 25). 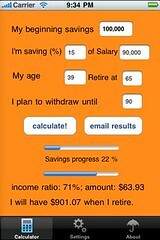 collegeFund is a college savings calculator iOS app (iOS 3.1.2 or later) I released a while ago (Oct. 5 to be precise). Link to iTunes App store here. For a limited time (this annual benefits enrollment and holiday season), I am making the v 1.0 app for free. I will end the promotion as soon as the v 1.1 approves. I am out of mind Actually I thought about this before the release. Over the years I came to believe college education is a prerequisite for many things in life: the college experience, the knowledge learned and friendship formed in college, last but not least, the skill of “how to learn on one’s own” and a path to entry level job. For me and my wife this is not possible without the sacrifice of our parents. This March our baby daughter was born, and we enrolled in a college saving plan for her shortly. We are just trying to repeat what our parents did for us. In the same spirit, we would like share this little app with all the hard working parents. Is it really free? Am I ask anything in return? 1) send me feedback, including write reviews on iTunes store, good reviews only ; send me unpleasant reviews by email (uudaddy no spam AT gmail DOT com). What if you already paid for the app? First I want to say “thank you”. I can either refund you the 99 cents, or give you the myNestEgg app. What if you already bought myNestEgg too? We are not entering an infinite loop here, let me know and I will send you something, for your patronage. I know, I know, I am a little late making the announcement. But I was fighting a small battle. Fix the problem in “email results” when income_ratio is larger than 100%, the email results shows 100%. Now it shows the correct number. Set default inflation rate to 2% (was 1% before the change); set default investment return rate to 7% (was 6% before the change). We believe the new numbers are more realistic numbers. Change the calculation of inflation adjustment to fix the “divide by zero” problem in some cases. I am at Philadelphia now. I came here for the VTM iOS conference. Took southwest Air from STL this evening, arrived phl slightly after 10. Planned taking the shuttle, but could not reach the guy per his instruction. Took train to market east/Philly conference center , then called a taxi to hotel. Saw quite some people on street on the way to society hill Sheraton. It seems free AT&T wifi only works on my iPhone, not MacBook. So I settle on iPhone for tomorrow conference info and how to get there. Oh, by the way, it seems apple fixed myNestEgg app update (1.1) stuck in “upload received” status. It’s in “wait fore review” mode now. This update will fix some of the bugs.